Mining the classic comedic subgenre of mistaken identity for all the laughs its worth is a difficult thing indeed as it’s one of the most often utilized comedic devices since the days of Chaplin, Keaton and Lloyd. But much to his credit, Kenji Uchida uses it as a mere jumping off point in Key of Life, employing the device as a framework for the plot from which he can delve into a wide variety of topics from simple loneliness to suicidal depression all the way up through identity theft and romantic midlife crises in this continuously surprising award-winning Japanese import. Now available to own on DVD and download from Film Movement, the international film festival favorite is a complete breath of fresh air for filmgoers given Uchida’s magical ability to explore some of life’s most tragic problems with the whimsically lightest yet nonetheless empathetically humanistic of touches. Gifted After School filmmaker Kenji Uchida offers us a tale of mistaken identity geared to the twenty-first century that’s as real as it is (at times) seemingly aware of its own cinematic influences. Serving as both writer and director, he delivers an impossibly irresistible blend of awkward romantic comedy and hitman suspense thriller that’s as interested in examining its trio of characters as alienated, lonely yet undeniably lovable oddballs as it is in entertaining us simply for entertainment's sake. The best topical alternative to Seth Gordon’s insufferably unfunny, mean-spirited and downright misogynistic misuse of Melissa McCarthy in Identity Thief, Kenji Uchida’s take on the same theme introduces us to Sakurai (Masato Sakai). A dejected, hopelessly indebted, recently heartbroken, out-of-work actor, Sakurai has become such a screw-up that he (thankfully) can’t even manage to successfully execute his own suicide attempt. After a rich-looking stranger named Kondo (Teruyuki Kagawa) slips on a bar of soap and knocks himself out cold on the bath house floor, Sakurai – seeing a way out that doesn’t involve his own death – replaces his locker keys with an unknown man in an impromptu moment of mad desperation. Having found a temporary solution to his money problems, our sad-sack hero pays off his debts and attempts to bring his bath house guardian angel back his belongings, only to discover that Kondo’s concussion has temporarily erased his memory, leaving the hospital under the assumption that the amnesiac stranger is in fact Sakurai. Under the impression that he’s an out-of-work actor – as Kondo tries to adapt to a life with which he’s unfamiliar, Sakurai enjoys the high life of buying expensive clothes, driving a fancy car and living in a swanky apartment. However, Sakurai’s Bling Ring life is soon brought to a screeching halt when he discovers that the reason that Kondo can afford such a lavish lifestyle is because he makes a killing… well, killing. Having taken over the identity of a legendary so-far unknown, unseen, underworld hitman who’s been dubbed Mr. Fix It, Sakurai is soon thrust into the life of a contract killer with the Yakuza hot on his trail. While Sakurai’s bad luck has followed him into his new life, the fake Sakurai has found his luck as an out-of-work actor changing for the better when the previously lonely Kondo befriends Ryoko Hirosue’s Kanae, an equally lonely yet lovely, workaholic, husband-hunting editor who’s made a promise both to herself and her dying father that she’ll get married in a matter of months. Setting deadlines to meet with regard to matters of the heart from meeting Mr. Right to getting engaged, finding the perfect dress and saying “I Do” all marked down in her planner, Kanae treats her quest to wed like it’s a position to be filled on the job. As such, she uses the same search criteria of a “robust, healthy, hard worker” to identify the right candidate personally and professionally and as the film begins, implores her staff to play romantic head-hunter right along with her. But once Kanae crosses paths with the amnesiac Kondo, she finds the role of a mate potentially filled after the two bond over their mutual love of classical music and love of list-making. Helping him move forward in life as an actor, unsurprisingly the stone-faced Kondo finds success being cast as a villain – using knowledge he doesn’t realize he possesses to make the roles come to life. 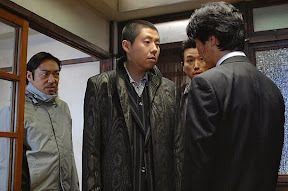 In fact, despite a talented ensemble cast, special recognition is owed to the film’s scene-stealing MVP Teruyuki Kagawa, for taking what could’ve been a stereotypical hitman role and making him the richest character onscreen. While John Landis’s Trading Places (which in itself kicked off a tidal wave of ‘80s movies that used the same character driven plot device) has been frequently cited as a chief source of inspiration, in my eyes Uchida’s work has much more in common with the whimsy and romance of Pillow Talk style Doris Day/Rock Hudson comedies and the edginess of Desperately Seeking Susan blended together with contemporary crime comedies. The result is a work that feels as light as it is dark and much more international than the product of any one country. 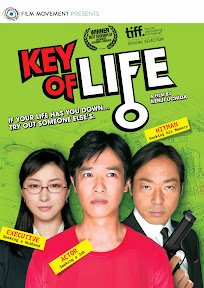 For, given Uchida’s multi-layered approach and desire to explore contemporary themes far beyond just hitting a plot point every ten minutes, you could just as easily see Key of Life remade as a frothy French romantic comedy in the same vein as the underrated, similar-in-spirit offering Après vous as you can in a completely serious telling of the tale served up by John Dahl. And regardless of how extreme its characters may initially be when we first meet them in their various stages of desperation, by zeroing in one of contemporary society’s greatest problems of loneliness as we’re all so cut off from one another thanks to the double-edged sword that is technology – Uchida has made a movie that is universal in its appeal. That rare dramedy that never hits a false note no matter how outrageous the amnesiac case of mistaken identity may be or how many films it pays tribute to in its whopper of a 128 minute running time, Kenji Uchida’s award-winning Key of Life is one of the best comedic releases Film Movement has distributed to its DVD-of-the-Month club in a long time. Sure to attract a larger audience through word-of-mouth now that it’s become available to non-members as well, Uchida’s latest work is an ideal title with which to kick off the New Year. A must for comedic screenwriters, this Key serves as a textbook example of taking one of the oldest plots in film and telling it in a new, truthful and thoroughly modern way so that it transcends time, language and genre simply by focusing its story on Life.